Support My Giving Helps: The MGH Fund + United Way campaign today. Help build the My Giving Helps campaign from the ground up. Why do you support the MGH Fund, United Way or both? My Giving Helps: The MGH Fund + United Way employee campaign celebrates a long-standing culture of philanthropy at our hospital and reaffirms our commitment to improving the health and well-being of our patients and our community. For over 16 years, Massachusetts General Hospital has partnered with United Way to give back to the Greater Boston community. 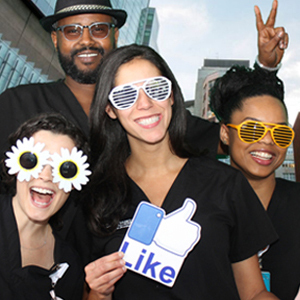 Every year this campaign celebrates and supports the best of what we do at Mass General. Thank you for being generous members of the Mass General community. Thank you to our My Giving Helps Co-Chair Committee! The easiest way to support the campaign is through a payroll pledge. Your pledge will be automatically made through a payroll deduction each pay period. Any new payroll pledge you make will override any existing pledge. You can also make a one-time gift to the MGH Fund, United Way or both! Your gift, in any amount, improves the health and well-being of our patients, their families and the diverse communities we serve. How will you support My Giving Helps? The success of our annual My Giving Helps: The MGH Fund + United Way campaign is a sign of how passionate our community is about Mass General, its mission and about giving back to the community. Please take this opportunity to join your colleagues and consider supporting My Giving Helps: The MGH Fund + United Way campaign today. Thank you for being generous members of the Mass General community. Your gift to the MGH Fund provides unrestricted dollars that benefit all areas of the hospital, including exciting new research, promising clinical initiatives, beneficial employee programs and community and global health efforts. Your gift to United Way of Massachusetts Bay and Merrimack Valley supports more than 180 organizations and initiatives that meet the urgent needs of children, youth and families in our community by creating meaningful, lasting change that touches everyone. From clinical advances at Mass General to helping local families in need, your generosity touches the lives of countless patients and members of our community. Below are stories and videos about how your gifts to the MGH Fund, United Way or both are helping to advance care within our hospital and support vulnerable populations in and around Boston. Since the discovery of circulating tumor cells (CTCs) some 140 years ago, researchers have struggled to create an efficient method of capturing these elusive and rare cancer cells – until now. The MGH Fund provided seed funding for Mass General researchers to develop the CTC-Chip, a device able to detect and isolate CTCs in the blood of cancer patients with much greater sensitivity than any other existing technology. The CTCs can then be analyzed to reveal critical information about cancer growth and the effectiveness of different treatments. Researchers believe the technology may revolutionize the way oncologists detect, monitor and treat cancers. The CTC-Chip technology was made possible through crucial seed funding provided by the MGH Fund. Mass General leadership saw potential in the idea presented by Mehmet Toner, PhD, director of the MGH Center for BioMicroElectroMechanical Systems, and Daniel Haber, MD, PhD, director of the MGH Cancer Center. Thanks to the flexibility allowed by the MGH Fund, the hospital was able to provide Dr. Toner and Dr. Haber with the resources they needed to transform their idea into a reality. What will Mass General researchers think of next? With your gift, anything is possible. Since the initial investment by the MGH Fund, the CTC-Chip team has received tens of millions of dollars in additional funding from outside the hospital. Most recently, Mass General researchers collaborated with Veridex LLC, on a third generation CTC-Chip that shows significant improvement over previously developed devices. For example, while the older generations of the CTC-Chip required four to five hours to process a single blood sample, the new system is able to handle a tube of blood in less than an hour. In addition, the new CTC-Chip no longer requires prior identification of tumor-specific target molecules, enhancing the ability of the device to analyze blood for multiple types of cancers. The CTC-Chip team is working to refine the system for commercial development so that it may eventually be available to cancer patients everywhere. “We hope to develop this technology to the point where it could be used for early diagnosis, which is the ‘Holy Grail’ that all of us working on CTC technology have been striving for,” says Dr. Toner. Your gift to the MGH Fund ensures that Mass General is able to translate promising basic research into powerful clinical tools and treatments as quickly as possible. Please consider the impact your contribution can have in helping Mass General meet health care’s most pressing challenges as we continue to work together to save lives every day. Willie Butler didn’t like the way his clothing smelled of fish after a long day of work at a South Boston seafood distributor. But when he was laid off 18 months ago, he would have done just about anything to have his job back. Until that point, Willie had always been able to support his wife of 13 years and their five sons. As months passed without any job prospects, he grew desperate. “Bills add up real quickly when you’re unemployed,” says 40-year-old Willie, a lifelong Boston resident. Though he collected unemployment and his wife was working, it wasn’t enough to sustain a family of seven. They sank deeper and deeper into the vicious cycle of financial debt. Willie had never asked for assistance before, but he knew he had little choice. “If you have to choose between asking for help or being on the streets, it’s not a hard decision,” he says. An estimated 11.7 million Americans, just like Willie, are unemployed. Your gift helps United Way provide families and individuals with a brighter, more stable financial future. When Willie found out about LIFT-Boston, a nonprofit that helps individuals and families work toward long-lasting economic stability and well-being, he was eager to get started. LIFT-Boston, jointly funded by United Way and the Local Initiatives Support Corporation, is one of four centers in the greater Boston area that bring together a continuum of financial stability support services – including financial counseling, job search and training support, housing assistance, tax and public benefit guidance, and referrals to other basic services – all under one roof. Research shows that clients benefitting from this holistic approach are far more likely to achieve substantial financial stability. Willie was partnered with a LIFT volunteer advocate, Ivy, who helped him set financial goals and begin working toward them. First, they made sure his family’s basic needs were met, obtaining Supplemental Nutrition Assistance Program benefits for food and signing him up for NSTAR and National Grid arrearage payment plans. They helped Willie secure steady housing and created a plan for covering the back rent he owed. Willie realized he wanted to pursue a career in construction instead of the food industry. LIFT helped him create his very first resume, highlighting his past landscaping and demolition experience, along with his volunteer work as a youth basketball coach. Next, Willie completed his OSHA 10 certification, a common requirement for construction workers, and – thanks to a networking opportunity provided by LIFT – got an interview with a major construction company. His ultimate dream is to buy a house, a dream that seems more realistic now than ever before. But Willie knows it’s one step at a time. For now, he and his wife are giving back by volunteering with LIFT – helping others in their community get back onto their feet. Your gift to United Way empowers individuals like Willie to take control of difficult financial situations and build a better, more secure future for their families. Please consider the impact your contribution in any amount can have in helping United Way and its partner agencies create lasting change. Four years ago, John Murphy was told he had less than six months to live. Undetected skin cancer had become stage IV melanoma and the once vibrant, active father of two was soon barely able to walk. As his symptoms continued to worsen, John learned about a successful clinical trial at Mass General that was testing drug therapies for his specific form of cancer. He immediately inquired about the clinical trial, and traveled from his Colorado home to Boston to undergo treatment. Today, John is hiking the mountain trails he loves again, thanks to the revolutionary cancer treatment being developed here at Mass General. This research was supported by the generosity of employees like you. 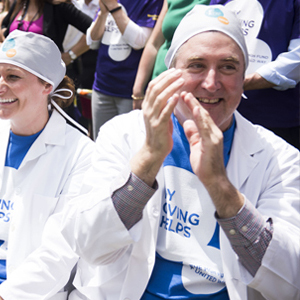 Please watch the video to hear John’s inspirational story and learn how your giving helps fuel groundbreaking science. Your gift to the MGH Fund supports Mass General’s transformational advances in the treatment of diseases like melanoma. Please consider the impact your contribution can have in helping Mass General meet health care’s most pressing challenges as we continue to work together to save lives every day. The Boys & Girls Clubs of Boston, a United Way-funded agency, has 10 clubs throughout the city serving approximately 14,000 children and teens ages 6-18. Recently, the clubs started offering a health education program. Mass General’s Jennifer Spina, RN, helped launch this program and has formed a valuable partnership between Mass General and our community. Her work has helped change the life of one teen in particular, Richard Garcia. Please watch this video to learn how this program is helping teens like Richard make smart choices, and how your giving supports youth programming that is building healthy communities. Your gift to United Way supports families, youth and children throughout our region by meeting urgent needs today in ways that strengthen our entire community for tomorrow. Please consider the impact your contribution can have in helping the United Way create lasting change. We are on the lookout for My Giving Helps Champions. Our campaign volunteers, known as Champions, act as advocates for the My Giving Helps: The MGH Fund + United Way employee campaign and help to build a grassroots campaign from the ground up. To sign up or learn more about becoming a Champion, please contact us at mygivinghelps@partners.org or fill out the form below. Thank You to Our My Giving Helps Champions! How can I donate to My Giving Helps? You may make a one-time gift to the MGH Fund, United Way or both at any time by clicking here. You can also make a recurring gift through payroll deduction to the MGH Fund, United Way or both during the campaign period of September 9, 2019 through October 4, 2019. Payroll deduction forms will be available here beginning in September. Is my gift to My Giving Helps automatically split between the MGH Fund and United Way? No. You will be able to designate an amount of your choice to the MGH Fund and/or the United Way. One-time gifts must be made directly to each organization for tax purposes. For payroll deduction gifts, please indicate the amount for each organization on the form. We encourage you to support both, but the choice is yours. Your gift will not be automatically split between both funds, and the campaign does not combine gifts to the MGH Fund and United Way. Do I need to make gifts to both funds to be part of this campaign? While you are encouraged to support the MGH Fund and United Way with a gift to each in any amount, you may choose to donate to one or the other. Your participation in the overall My Giving Helps campaign will still be recognized. Can I volunteer to help with the My Giving Helps campaign? Yes! We have many opportunities for you to get involved with the campaign and be a leader among your colleagues while having fun. Find out more and sign up to become a My Giving Helps Champion here. Will my payroll deduction gift(s) to the MGH Fund and/or United Way roll over to next year? Yes, your payroll deduction will automatically renew each year unless you cancel or modify it. How can I update or cancel my payroll deduction? During the My Giving Helps campaign period of September 9, 2019 through October 4, 2019, you may alter your payroll deduction gift or make a new payroll pledge to the MGH Fund and/or United Way here. If you would like to cancel your gift, please email mygivinghelps@partners.org. When do my payroll deductions to the MGH Fund and/or United Way begin? New payroll deduction gifts made during the My Giving Helps campaign period of September 9, 2019, through October 4, 2019, will start in January 2020. If I make my gift through payroll deduction, is it deducted out of my pre-tax or post-tax pay? All gifts made through payroll – whether to the MGH Fund or United Way – are post-tax, but they are fully tax-deductible. You will receive a tax statement regarding your donation to the MGH Fund from Mass General's Development Office after the first of every year. You will receive a separate tax statement from United Way if you donated via cash, check or credit card. If you made a United Way contribution via payroll deduction, you may use a pay stub or W-2 form to substantiate the annual amount withheld. Can I make a gift in cash or by check? Yes, cash or check donations can be mailed to the MGH Development Office at 125 Nashua St., Suite 540, Boston, MA 02114. Checks to MGH should be made out to Massachusetts General Hospital and checks to United Way should be made out to United Way of Massachusetts Bay and Merrimack Valley. Please include a note indicating that this is for the My Giving Helps campaign. How much are people giving? What do you expect of me? Your gift of any amount will be greatly appreciated. Whether you give a few dollars a week or make a one-time gift in any amount that you feel is appropriate, your giving does make a difference. Our goal is to encourage as many employees as possible to contribute to the MGH Fund and United Way as a means of showing Mass General's commitment to our patients, families and community. If every staff member gave just $1 a week, it would amount to more than $1 million a year! Yes, simply check the anonymous box on the pledge card or form you fill out. Will my co-workers know if I gave or did not give and how much I gave? In appreciation of our donors' generosity, we will be listing all donors to the MGH Fund and/or United Way alphabetically on the MGH Intranet. We will not be listing donors by gift amount, or if they request to be anonymous. What if I designate my gift to another Mass General fund? Does it count? Gifts made to a restricted fund at the hospital via the My Giving Helps campaign will count towards the overall participation goal. However, they will not be counted in the campaign's fundraising total. While we are very grateful for your support to any area of the hospital, The MGH Fund and United Way are the two recognized philanthropic priorities of Mass General and the My Giving Helps campaign. The MGH Fund supports Mass General's overall mission, allowing us to pursue advances in medicine and research throughout the hospital. There is no corner of the hospital or clinical specialty that the MGH Fund has not touched. In fact, some areas that have received funding from the MGH Fund directly benefit our employees, such as the Ambulatory Practice of the Future and the Be Fit program. Your unrestricted gift to the MGH Fund allows the hospital to grow and thrive. We greatly encourage you to designate your gift to the MGH Fund and to ask others to do so as well. I want to split my gift between two different areas at Mass General. Is this possible? Yes. When you are filling out the gift form, simply write the fund names and percentage of the entire gift that you want directed to each. However, only gifts designated to the MGH Fund and/or United Way will count towards our campaign goal. What does my gift to the MGH Fund support? Your gift to the MGH Fund provides unrestricted dollars that touch all clinical areas of the hospital. Mass General leadership uses the MGH Fund to support particularly promising research, improve safety and patient care and foster healthcare initiatives around the globe and in our neighborhoods. Gifts to the MGH Fund keep Mass General at the forefront of modern medicine by allowing us to meet pressing opportunities and challenges in today's dynamic healthcare environment. Find out more about how your giving helps. What does my gift to United Way support? United Way of Massachusetts Bay and Merrimack Valley is advancing the common good in our region by providing help today in ways that will strengthen tomorrow. The organization's work ensures that children are ready to learn when they enter school, stay engaged in learning and graduate ready to compete. The organization also ensures children are nurtured by families that have the financial stability to support both their basic needs and future success. No other single organization has the scope, expertise and influence to bring together hundreds of human services agencies, government, businesses, private foundations and dedicated volunteers around a common vision of creating maximum impact and achieving long-lasting results. Find out more about how your giving helps. Why did you combine the campaigns for the MGH Fund and United Way? My Giving Helps: The MGH Fund + United Way celebrates a culture of philanthropy at our hospital and reaffirms our commitment to the Mass General mission of improving the health and well-being of our patients, their families and the diverse communities we serve. By joining the MGH Fund and United Way campaigns under one umbrella, you now have the opportunity to holistically support that mission. We also understand that being asked for donations at different times throughout the year can be confusing. By combining two of the hospital's philanthropic priorities into one campaign, we hope to make the process easier and more focused. How can I use stock for my gift? Yes. It’s easy to donate stocks, bonds and mutual fund shares to support Mass General, and it may provide you significant tax benefits. Click here to get started. Can I use other assets for my gift? Yes! Your IRA, life insurance policy and Donor Advised Fund are all potential sources of immediate support. And remember, with minimal effort and no cost, you also can name MGH alongside family members to receive a portion of your account assets. Learn more. How can I support My Giving Helps through my longer-term plans? There are so many ways to give without affecting your finances today. Review your options. For questions or comments, please complete the form below, call the My Giving Helps team at 617-724-6440, or email mygivinghelps@partners.org. Why do you support the MGH Fund, United Way or both? How does the MGH Fund help you or your work? Do you have a special connection to the United Way or a United Way-funded agency you’d like to share? The Phillips Society represents those who include the hospital in their long-term plan, through a will or other future gift commitment of any amount. For some, it’s the designation of Massachusetts General Hospital as a partial beneficiary of a retirement account or life insurance policy. For others it’s a gift that first provides income for life and then supports the hospital.